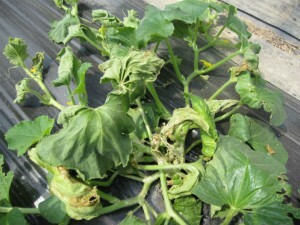 Bacterial wilt of cucurbits is a devastating disease, affecting many members of the Curcurbitaceae family such as cucumber, melon, pumpkin and squash. The causal agent, Erwinia tracheiphilia, overwinters in the digestive system of spotted (Diabrotica undecimpunctata howardi) and striped (Acalymma vittatum) cucumber beetles. 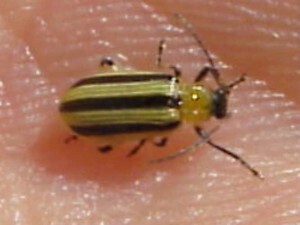 When these beetles emerge in the spring, the pathogen is spread from beetle feces to healthy cucurbits mainly via wounds caused by insect feeding. 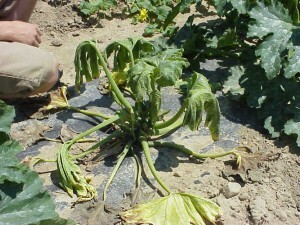 Symptoms begin as discoloration and wilting of individual leaves. 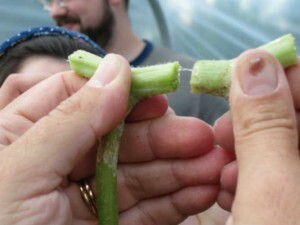 As the disease progresses, the entire plant begins to wilt and collapse as the bacteria clog the xylem vessels. 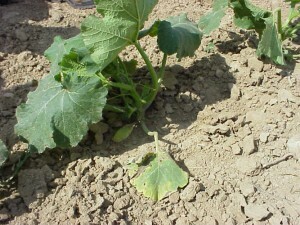 To prevent disease introduction into cucurbit fields, insecticide application is important while the plants are emerging. 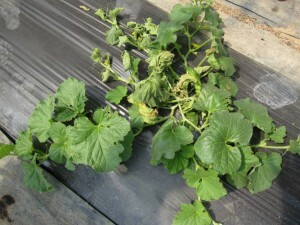 Wild plants within this family, such as buffalo gourd, coyote gourd, burcucumber and wild cucumber, can also serve as hosts for the pathogen (Smith, 1911).